You must complete the general registration for congress if you plan to attend. You must complete each of the other forms if you want to participate in breakout sessions, show and tell and the challenge. All the forms can be found under the Quilt Congress link. Try your hand at impressionistic flower applique in this 3-hour technique workshop. 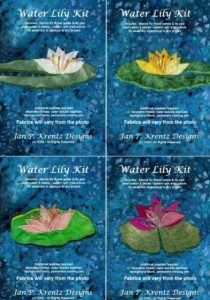 machine applique technique to embellish projects with dimensional water lily flowers and buds. The workshop will cover the use of embroidery foundations, threads, and stitch techniques. • heavy weight zip-lock style project bag. Colorful specialty thread will be available for use during class. 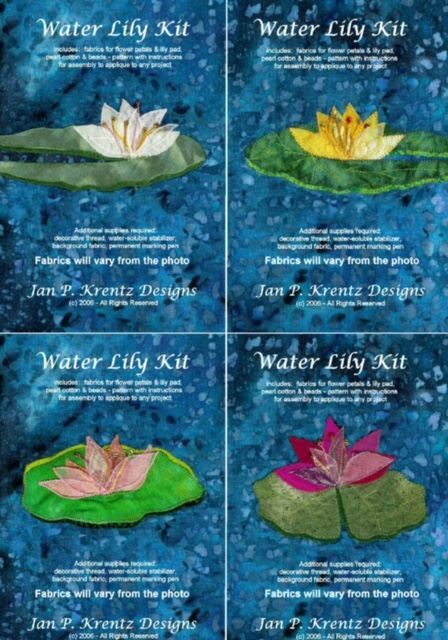 If you are taking Jan Krentz’s Water Lily class at Quilt Congress, you will have the option of one of these four kits. Click on this link for the supply list for the Lynn Hagmeier class.